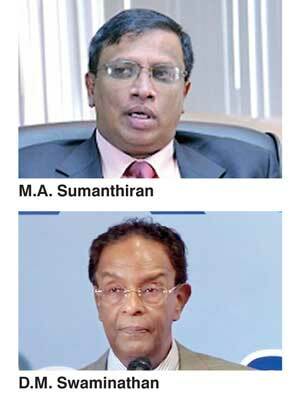 The main opposition Tamil National Alliance pitched into Resettlement Minister D.M. Swaminathan in Parliament yesterday, demanding his resignation over the controversial Government proposal to build 65,000 prefabricated steel houses for war affected families of the North and East. TNA Jaffna District Parliamentarian and party Spokesman M.A. Sumanthiran used his time during the committee stage debate of the vote on the Ministry of Prison Reforms, Rehabilitation and Rehabilitation to issue a scathing criticism of the Minister, who he said was adamant to go ahead with the controversial housing project, even after Tamil representatives from the region had informed him that it was riddled with fraud. Sumanthiran said the Minister was still defiant and still making statements to the press about the project. “We cannot allow you to continuously damage our people’s future like this. We have to publicly say that we have no more confidence in the conduct of this minister,” he charged. “It is our request in this House today, that you relinquish your portfolio or we will be forced to call for a division and reveal all the facts to the country,” the TNA MP warned. The heated hour-long debate on the steel houses gave rise to interventions from members of the Joint Opposition that were shot down by Prime Minister Ranil Wickremesinghe who promised to bring both the TNA and the Minister to the table for discussions about the proposed housing project. The Prime Minister also promised Opposition Leader R. Sampanthan that 80 percent of the houses the Government was proposing to build in the North and East would be brick and mortar constructions. “The rest will be from steel because some people have asked for it. If there is a demand for more we will supply,” Premier Wickremesinghe said. Through constant disruptions and interruptions, Minister Swaminathan claimed that several TNA MPs from Batticaloa, Mullaitivu and Kilinochchi had written to him, requesting the prefabricated houses. “I have the documents, I can prove it to you,” he claimed. He claimed EPDP Leader Douglas Devananda had requested 37,000 houses, a statement that caused the TNA benches to erupt in protest again. The Minister said that the TNA’s alternate proposal had price contradictions and did not seem to indicate firm commitments from the local banks. Swaminathan also defended ArcelorMittal, saying that it on a list of “100 fortune companies in the world”. “I am not trying to bring a mushroom company to this country,” he charged. During his speech TNA Legislator Sumanthiran said that now that the project was being reviewed in the face of major opposition to the scheme, the TNA was being asked to allow Minister Swaminathan to have at least 10,000 houses. The TNA MP said he was not accusing the Minister of trying to make money. “But imagine what the necessary inference will be, if you stand on your head like this and insist that at least 10,000 houses must be built?” he demanded. Sumanthiran charged that Minister Swaminathan had told him during an event in Sampur that the Luxembourg-based steelmaker ArcelorMittal would be the company to construct the 65,000 houses even before cabinet approval was granted to the project in September 2015. “You told me the name of the company that would build the houses even before the tender was conceived of. How did you know that even before you got cabinet approval for the project? I raised the question even then, about how the tender process could be just and transparent when the Minister had already named the company,” the TNA MP revealed. He demanded why Swaminathan was adamant on the project even after all 16 TNA MPs had written to the President stating their reasons for opposition to the proposal. “You go around the country saying the TNA is blocking development – but we don’t want others lining their pockets in the name of our people,” the TNA MP charged, directly addressing Minister Swaminathan. To counter what he called the Minister’s “malicious propaganda” Sumanthiran said the TNA had submitted an alternate proposal drafted in collaboration with a civil society consortium, to build the same number of houses at half the cost, and with loans from local banks. With the ArcelorMittal contract, the Government would pay USD 1 billion over a period of 10 years, at Rs 1.6 million per house made of prefabricated steel. The TNA-civil society proposal estimates the cost of a brick-and-mortar house at Rs 999,950. “Several submissions of that proposal to you have gone unheeded, so we tabled that proposal in this House,” Sumanthiran charged. The TNA backed proposal, the MP said, would generate some 13,000 jobs in the region over four years. The local agent for AccelorMittal, the TNA lawmaker told the House, was allegedly businessman Ravi Wettasinghe, a man he said had been implicated in fraud and arrested at the Katunayake airport as he was attempting to flee the country. Newspaper reports had revealed that Wettasinghe was a staunch UNP supporter and had even funded the party, Sumanthiran said. “I would like to know from you directly today, whether Ravi Wettasinghe is the local agent or connected to ArcelorMittal in some way,” he demanded from Swaminathan. The TNA Lawmaker also charged that ArcelorMittal was under criminal investigation in Paris. The UK’s Daily Telegraph newspaper reported in 2013 that ArcelorMittal was being investigated in the French courts over claims of alleged criminal conduct in an escalating legal row with hedge funds and other investors. The company, owned by one of the biggest backers of Britain’s Labour Party, has a controversial corporate history. Sumanthiran also slammed Minister Swaminathan for his recent remarks to the press, claiming that the 13th Amendment was an adequate solution to the Tamil question. “Who are you to say that? You are on the steering committee to draft a new constitution. Why do we need a new constitution if 13th Amendment is the solution? Ask yourselves those basic questions before you speak. You don’t realize the type of damage you are doing to the community,” the TNA Parliamentarian thundered. In an attempt to lighten the mood, Prime Minister Wickremesinghe quipped that the issue was just a “Jaffna battle of words”. “This is just a difference of opinion, we will resolve it through discussions, not through bullets,” Wickremesinghe told the House taking another swipe at the JO and its treatment of Tamil politicians like N. Raviraj during their tenure in office. Joining in the debate, Opposition Leader Sampanthan demanded a direct answer from the Prime Minister about the TNA’s alternate housing proposal. Prime Minister Ranil Wickremesinghe apologized for the burning of the Jaffna Library, in a significant statement that came while the House was in a state of uproar over the controversial 65,000 houses project for the North and East. “The Jaffna Library was burnt during a UNP Government. That was wrong. We regret it, and we ask forgiveness for it,” the Prime Minister said.